Pretty much, I’ve been rapping since my Elementary/Middle School years with my Cali classmates: Keith “Stranja” Coleman, Benard “BB” Benford, Steve “Stylez Steve” Whiting, & Daniel “Lil Dee” Davis. Thanks to an unwanted push by my big brother & CEO David “Big Dave” Mitchell I kept it going. But it wasn’t until my Senior year in High School when I decided to take it serious & get into a professional recording facility with my classmates: Branton “Playa Spade” Walker, Eric “P.I.” Withers, Richard “Richie B” Baird, Derick “Big 50” Hatley, & Armaad “Sunkist” Fitzgerald. 2pac, Ice Cube, Nas, E-40, Busta Rhymes, Brotha Lynch Hung, & Tech N9ne. U can never get those artists mixed up with anyone else. Styles that stand out on a track with a message to go along with it, that’s what I’m into. I did some production work on Tyler Perry’s “Temptations: Confessions of a Marriage Counselor” earlier this year. We’re in discussions of landing more production for Tyler Perry’s 2014/2015 projects. Also, I just received a contract to do a track for an independent film for Nick Canon. I have a few other major works in the making but it’s too soon to discuss. My fingers are crossed. My main focus right now is the “Trunk Muzik” single, which by the way is available on iTunes, Amazon, Google Play, WIMP, Deezer, Rdio, Muve, iHeart Radio, Shazam, all that good stuff lol. “Trunk Muzik” video shoot coming soon as well. I always tell people to keep God first in your life. No matter what it is, he can make it happen. Say your prayers, do right by people & hit the ground running. Most importantly, if you’re an artist & you’re sitting at home all the time, you can’t expect the universe to open up & accept someone whom they never even seen. Have you ever voted for a politician who you’ve never heard of but seen their name on the ballot? Hell naw!!! Get out of the house!!! Out of sight, out of mind. I’ve been on the Little Rock (Arkansas) music scene for over a decade. I’m like the big brother to the scene. Artists, radio personalities, DJ’s, producers, promoters, etc . all come to me for my advice or input about improving our local scene. I always give my people the real, so anything I see out in the industry, I inform my city/state when they ask me. They respect me simply because I keep it real with them, nothing less. I’m nobody special though. I still put my pants on the same way the next man does. I’m not flashy, materialistic or vain. My music represents the working class, [the lower class.] You know, the class they don’t discuss on television. Since my first single released, I’ve done about 6 shows in the past month. A couple of paid shows, but the rest were promotional. I’ll be traveling in the next few weeks to boost my promotional campaign even further. Coast to coast. 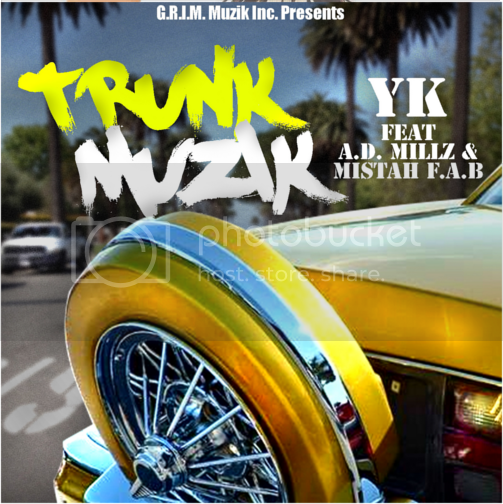 The artists that were featured on the “Trunk Muzik” single are both on the come up. A.D. Millz just released his 1st mixtape entitled “1983 A.D.” on datpiff.com & touring through the West Coast as we speak. Mistah F.A.B. is all over the map as a performing solo artist, as well as writing hits for some of the most credible artists in the game. As far as my scene goes, you must come to Little Rock to understand the caliber of musicianship/talent that’s going on out here. I was born in Little Rock, raised in Southeast San Diego and I must say, those are 2 of the most slept on cities I’ve ever known. The list is way too long & I don’t wanna leave anyone out so I’ll just leave it at that. But know that my team, G.R.I.M. Muzik Inc. is a frontrunner label for the state of Arkansas. In conjunction with Get Money Ent, RTLD Media, Boss Chic Ent, & Onthagrind Dotnet.